So after 8 years of them looking the same…. …..they received a great facelift, thanks to D. Lawless Hardware. D. Lawless Hardware is my go to place for gorgeous hardware. BEFORE with the burnished brushed nickel hardware. 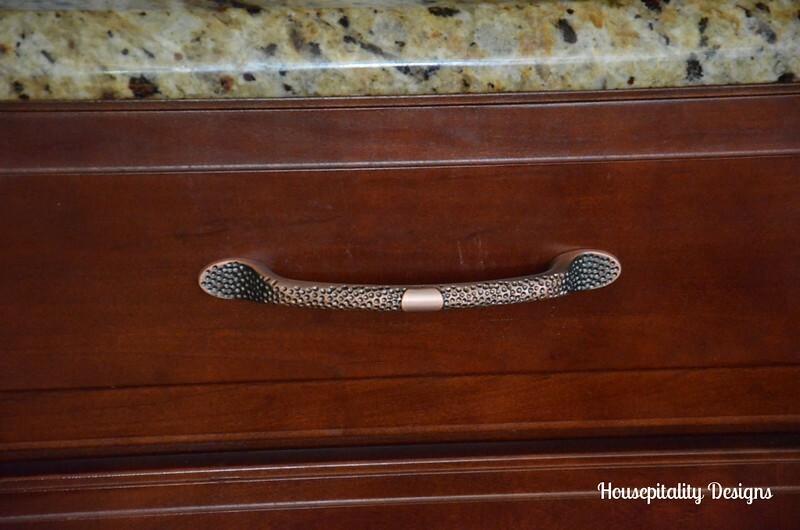 AFTER with the hammered copper hardware…. Looks like I will be on the lookout for more copper accents in my kitchen. 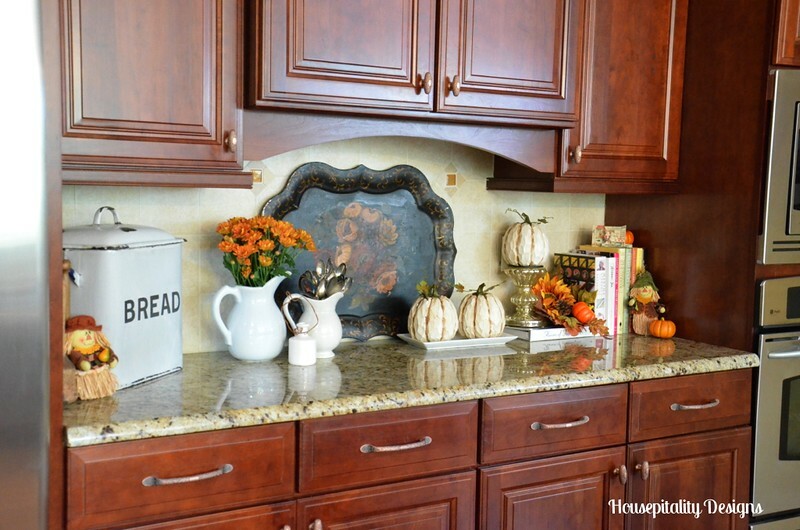 Since the cabinetry received a facelift…the counter expected one too! 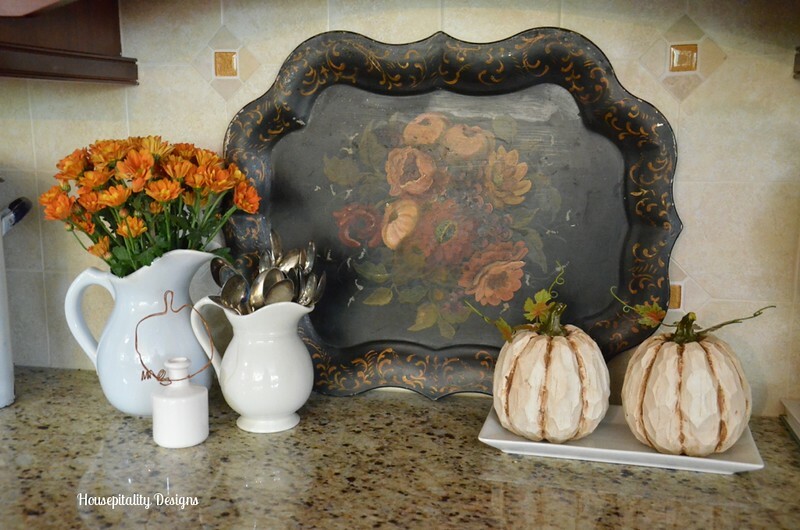 The “well used” vintage tole tray fits perfectly into the Fall decor. 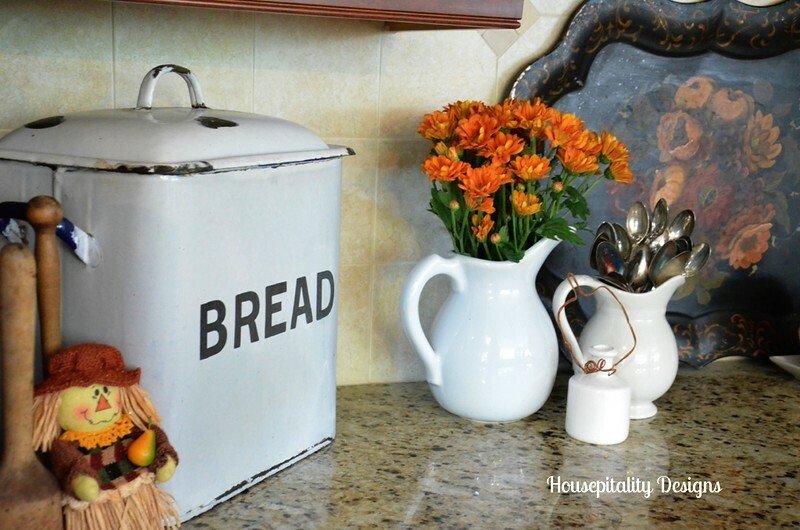 So here is one section of the kitchen with the new hardware and Fall Decor…. THAT YOU DO NOT WANT TO MISS!!!! Shirley I really like this hardware. Makes a big change and update. Those pumpkins that you have, can I just say, JEALOUS!!! Love!!! I really love what you have done so far for fall. Can’t wait to hear your announcement!!! That is some really pretty hardware. Love your fall touches. It is going to have to get a bit cooler for me to get in the mood to add fall decor. I have added a couple of things. 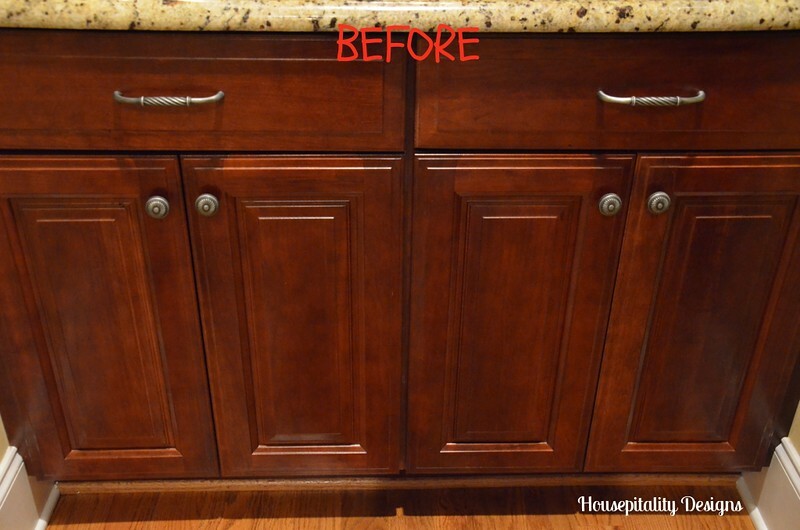 Love the new hardware….it looks like it was specifically made just for those cabinets. Can I ask where you got those adorable pumpkins? They are too cute! 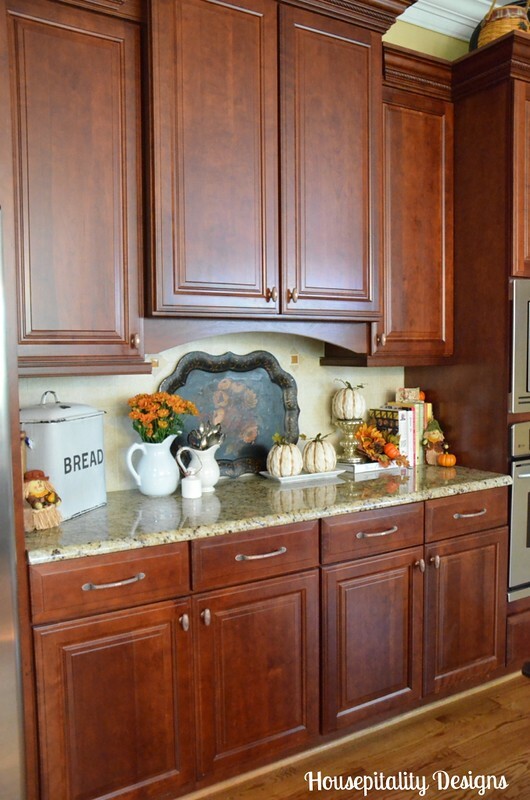 I am happy that you wouldn’t think of painting the cherry cabinets… They are so classic and will always be in style. Your kitchen is beautiful and the hardware is a nice change. Your fall décor is just the right amount of color. Shirley, the copper hardware works so well with the cherry cabinets! I can just see all of the copper accents that you can add! And all of your Fall touches are wonderful! Can’t wait to see more! You always have such pretty things! as much as I like white cabinets , I would never paint yours. They are gorgeous and with the new hardware gives you a new look for 8 more yrs. Your kitchen is beautiful and so warm with your wood cabinets. So pretty Shirley. The hardware is so pretty and it’s not the same thing everybody else has. That’s always a bonus. Love those pretty pumpkins and the pitchers. That area of the counter is perfect for decorating. The new hardware is gorgeous, Shirley! 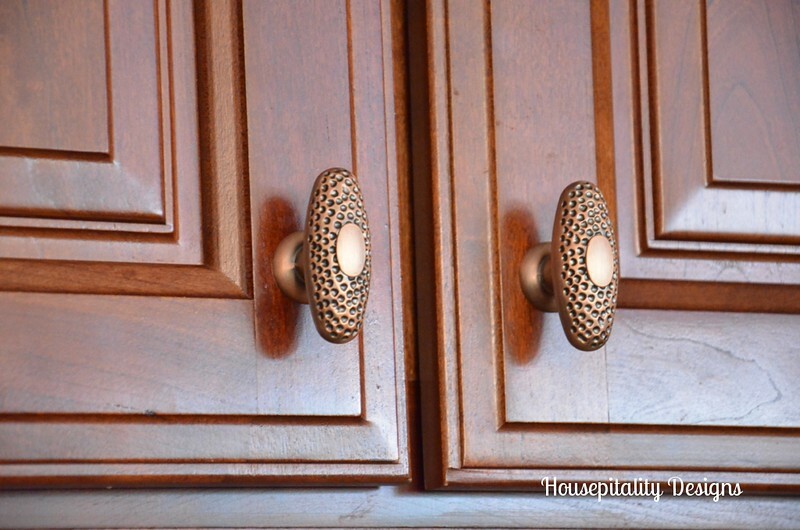 I love the update to the cabinet hardware; it looks fabulous! Hummm, what do you have up your sleeve? I can’t wait to hear! 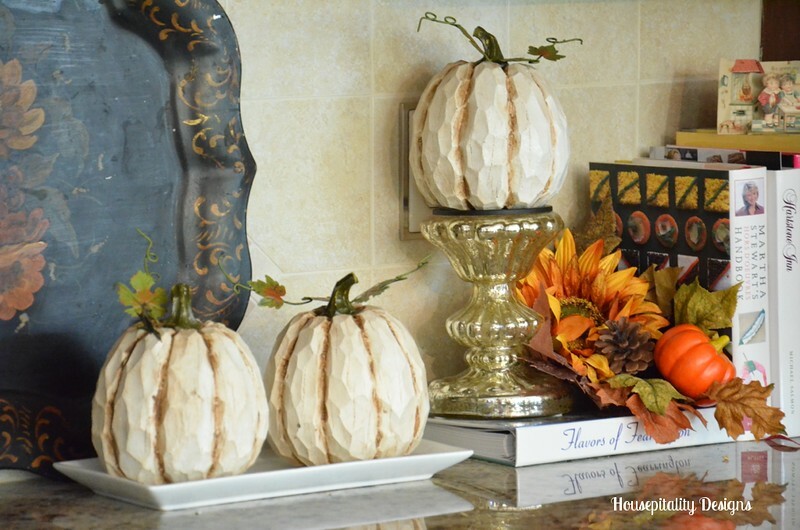 I love your Fall vignettes! They look great! Gorgeous! But I Wouk not expect anything less. They look like you and go with your home perfectly. Beautiful new hardware, just a few changes can make a difference. Also your countertop vignettes are gorgeous. 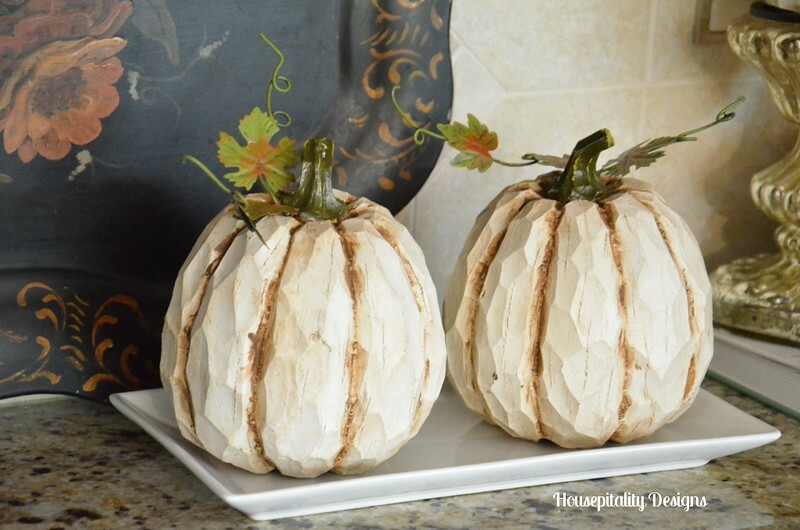 Love the pumpkins and how you elevated one on the silver candle holder. Hi Shirley! Oh, your new hardware is just gorgeous on your beautiful cabinets! I love the rich look of your wood. 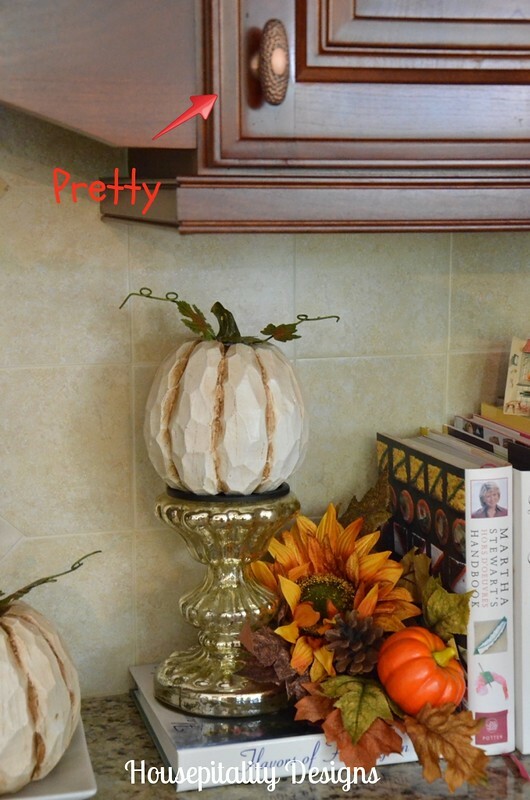 You have some sweet little fall vignettes going on too! Love the copper hardware Shirley! What a great excuse to look for some copper pots and accents for the kitchen 🙂 Love your tray vignette and pumpkin! I love how changing the hardware can make such a difference! I have been busy doing the same in my bedroom. Have fun packing. This looks great. 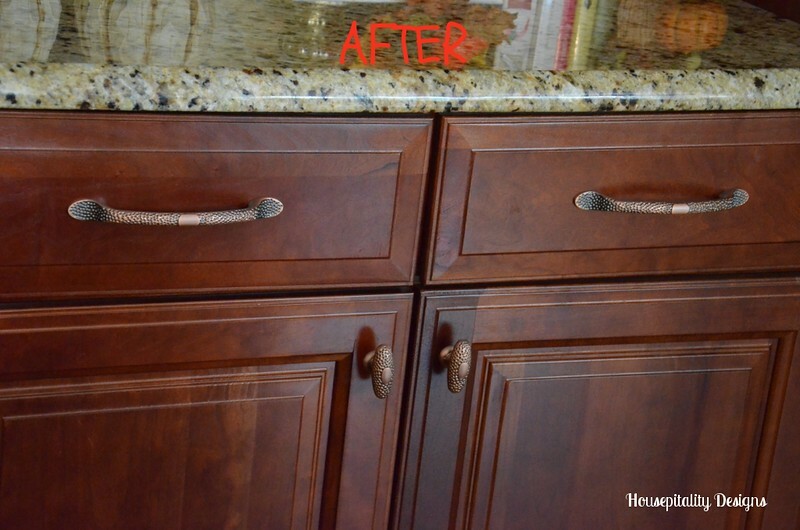 Your cabinets are beautiful and the new hardware was the perfect jewelry. The fall touches are just right, love those carved pumpkins. 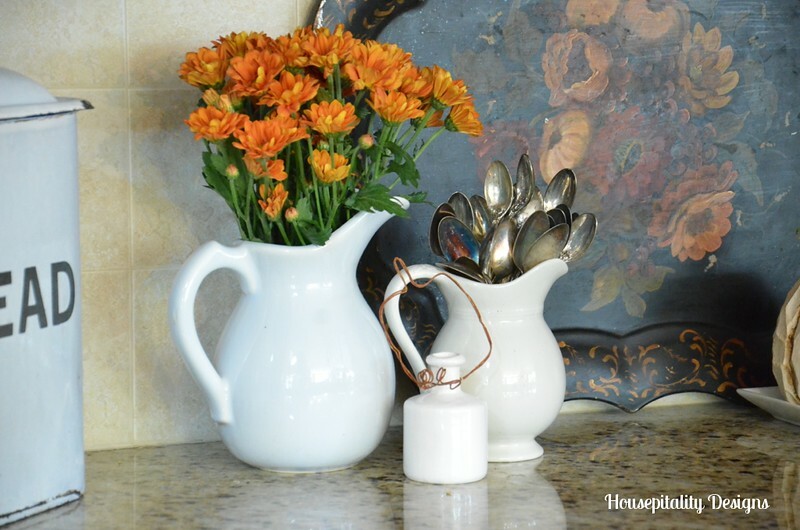 Love the new hardware Shirley and love the pretty vignette on your counter too!